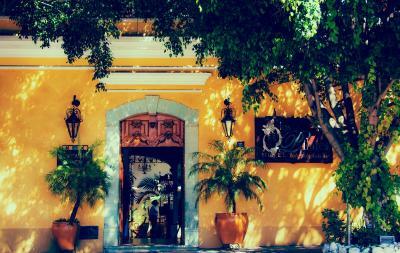 Lock in a great price for Los Pilares Hotel – rated 9 by recent guests! The roof top restaurant is lovely. The staff is very helpful. Staff was incredible, restaurant set up so unique and special. Great food for breakfast!!! I loved this hotel - great, safe and cute neighborhood and so nice to be a little away from the noise of the city center. We were two women and never felt unsafe walking around here. The staff was super helpful and the hotel terrace and all the potted plants make the space feel very relaxing. We liked the staff. They were very helpful. Also enjoyed the pool, just big enough for us to cool down in. Restaurant was excellent! We ate breakfast there every morning. Attentive staff. Loved the latte's and fruit bowl. We wished there was a spot where we could refill our water bottles. Hate using so much plastic. However, when I mentioned this to the concierge she had the staff bring us water in glass water bottles instead of plastic. We really appreciated this. Thanks Sara! I enjoyed the restaurant for morning coffee and everything I ordered was delicious. Clean, comfortable and pleasant environment. The restaurant upstairs is delightful with good service and quality of food. Rooms are spacious, clean, and secure. Staff are friendly and accommodating. This hotel is really quite beautiful. The restaurant is wonderful and served a delicious breakfast each day. At night we sat in the hot tub and enjoyed the most delicious margarita I have ever had. The staff were friendly, helpful and very accomodating. I felt completely safe here. The staff were absolutely amazing and were very responsive to our requests. We felt they sincerely wanted us to have the best possible stay and were most helpful with information and booking activities for us. We really liked our room with windows opening into the courtyard because we didn’t hear any street noise. Location was quiet but yet close enough to walk everywhere. Los Pilares Hotel This rating is a reflection of how the property compares to the industry standard when it comes to price, facilities and services available. It's based on a self-evaluation by the property. Use this rating to help choose your stay! Los Pilares Hotel is located in a charming colonial-style Oaxacan house with a small outdoor pool and free onsite parking. Oaxaca Bus Station is 1,500 feet away. All rooms at Los Pilares Hotel include satellite TV, ironing facilities and a mini bar. Each has a private bathroom with a shower and toiletries. The hotel has a restaurant and snack bar with a terrace. Room service is also available. Los Pilares has a 24-hour reception desk, and offers laundry, dry cleaning and babysitting services. Free WiFi is available in public areas. When would you like to stay at Los Pilares Hotel? This air-conditioned room features 2 double beds and includes satellite TV, ironing facilities and a minibar. The private bathroom with shower includes toiletries and a hairdryer. This air-conditioned room features an extra large double bed and includes satellite TV, ironing facilities and a minibar. The private bathroom with shower includes toiletries and a hairdryer. This air-conditioned room features a double bed and includes satellite TV, ironing facilities and a minibar. The private bathroom has a spa bathtub and shower, and includes toiletries and a hairdryer. House Rules Los Pilares Hotel takes special requests – add in the next step! Los Pilares Hotel accepts these cards and reserves the right to temporarily hold an amount prior to arrival. Pool area much smaller than expected. Felt a little mislead by the photos of the pool. It's tiny, with only 2 sun loungers. The guy who took that photo, making it look that big, is some kind of photographic genius haha. So don't book this place based on the pool! Staff were superb. Deluxe room with jacuzzi. Great location - short walk to town centre. We wished there was a spot where we could refill our water bottles. Hate using so much plastic. However, when I mentioned this to the concierge she had the staff bring us water in glass water bottles instead of plastic. Fabulous staff, great location, excellent breakfast and restaurant. We enjoyed our stay very much. There was no windows in the room, therefore no balcony, natural light or view. Safe is not large enough to fit a computer. The beds and pillows were a little hard. At night I wasn't comfortable walking around but there were a couple restaurants right down the street. The pool and jacuzzi need no better maintenance and temperature control. The food and the service were phenomenal!